Jenny and Ryan lied to me. I realize now that they did it out of necessity, they didn’t want me whining about the length of the car ride all day, but they lied to me nonetheless. I distinctly remember a conversation in our room at Cabinas Las Olas in Playa Avellanas in which they assured me the drive to Jenny’s parent’s lodge on the Osa Peninsula would take 6 hours. 6. Not 12. 6. 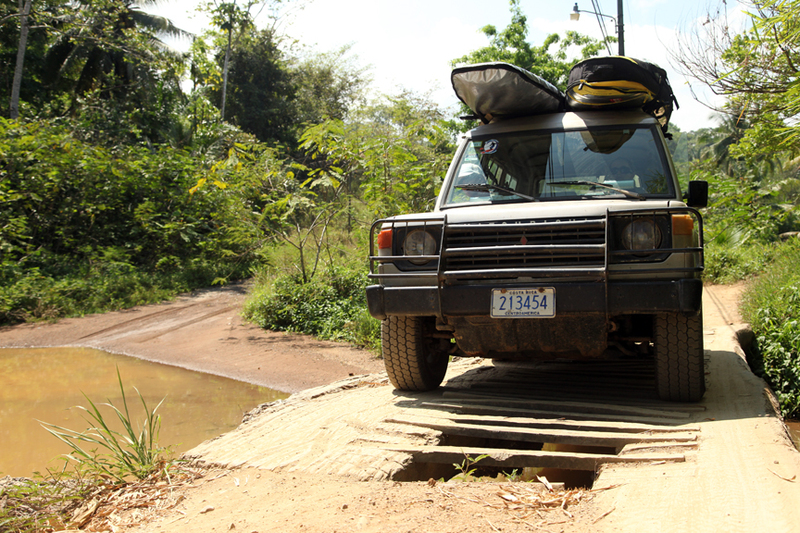 After returning the surftech boards to Costa Rica Paddle Surf in Tamarindo, we started the trek at 11am. More and more trees began to appear along the side of the road as we made our way down the coast. The farther south we went, the more beautiful the landscape became…almost beautiful enough to take my mind off the fact that 6 hours in the car had come and gone and we were nowhere near our destination. Orlando, our stuffed monkey friend clung tight to the handle in the car, blowing in the wind wondering when it was we were ever going to get there. Now, I don’t know if you have ever taken a road trip in a car that is 30 years old with 375,000 kilometers on it, has tons of um…”personality” let’s say, has a slightly sketchy suspension system, and the list goes on. It isn’t exactly the smoothest ride out there, but it is definitely an experience. The Montero came to be known by us as the “Gnar car,” it held in there like a champ and I am so glad that it was our ride of choice. It added so much personality to the trip. 9 hours into the drive it was dark, really dark and getting more so as we drove further into the jungle. The lights on the Montero were not the brightest ones I have ever seen and we all ignored the fact that they were becoming dimmer and dimmer with each minute that passed. Jenny was maneuvering us through a windy, dusty, lightless road full of potholes that could swallow an elephant when it happened: a pothole came out of nowhere. We hit the pothole and everything went dark. What little lights we had were now gone. So now, there we were, three girls and Ryan in a beat up Montero in the middle of the Costa Rican Jungle at night with no lights. The situation didn’t exactly make me feel warm and fuzzy about our chances of making it to Jenny’s parents lodge with all of our belongings in tact, but we really had no choice and Jenny soldiered on in the driver’s seat. We had been driving in complete darkness for about an hour when we were passed by another car. The other car breezed by us and continued on. Meanwhile we are bumping and jolting along this road in the dark. They must have thought we were completely insane. About 10 minutes later, we noticed the same car passing by us again going the other direction. When they had almost gone out of sight, Shannon turned around and looked out the back window and said “umm, guys, I don’t want to make you nervous, but that car is turning around behind us and I think they are coming back this way.” This is not the statement you want to hear while in our situation. The car had in fact turned around and was approaching us from behind. Jenny was still trying to negotiate the road, Ryan was trying to keep all of us calm and Shannon and I were in the backseat trying to hide all of our stuff to the best of our ability. I don’t know how much good stuffing my computer under my seat really was going to do, but it made me feel slightly better at the time. As it turns out, the family in the car wanted to help us. They drove for about 10 miles out of their way in front of us so that we could utilize the lights from their car. When we reached the turnoff point for where we were going they wished us luck and off they went. With 2 hours to go, we pulled out Shannon’s high powered head lamp, Ryan held it out of the passenger side window and we drove through rivers, over rickety bridges and through the jungle, eventually making it to Drake Bay. Once we had reached the bay, we had a short boat ride to the lodge and then a tractor ride up a hill and we were there. It was midnight by the time we were in a room ready to lay down, and was dark enough to not be able to appreciate where we were. The next morning we all woke up to the sound of monkeys jumping on the roof, then sat in the dining room for breakfast surrounded by giant blue butterflies, toucans, weird racoon looking things that I can’t remember the name of, monkeys, and more jungl-ey beauty than I thought was possible. I still can’t believe it, but Jenny’s parents lodge was so cool it made up for the fact that they lied to me about the 6 hour car ride. 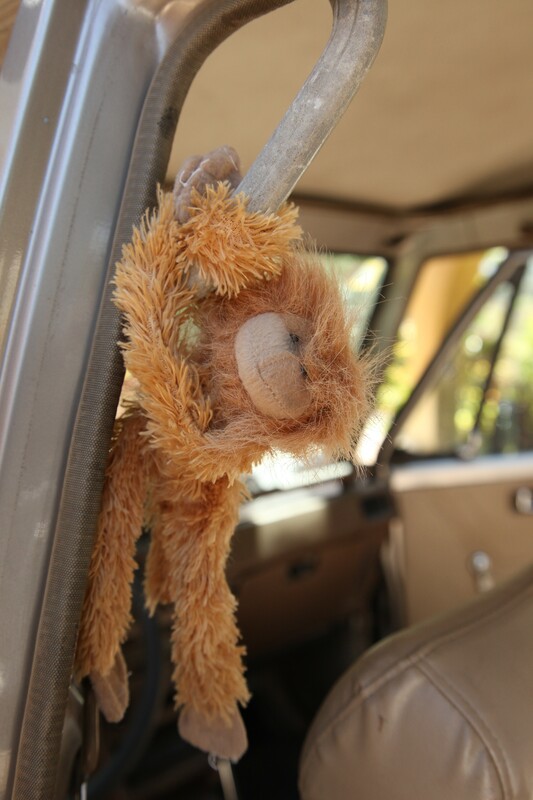 **Side Note: While the Montero was parked in Drake Bay, Orlando, our faithful stuffed monkey friend was stolen. We are offering a handsome reward for knowledge of his whereabouts and his safe return. Poor Orlando. 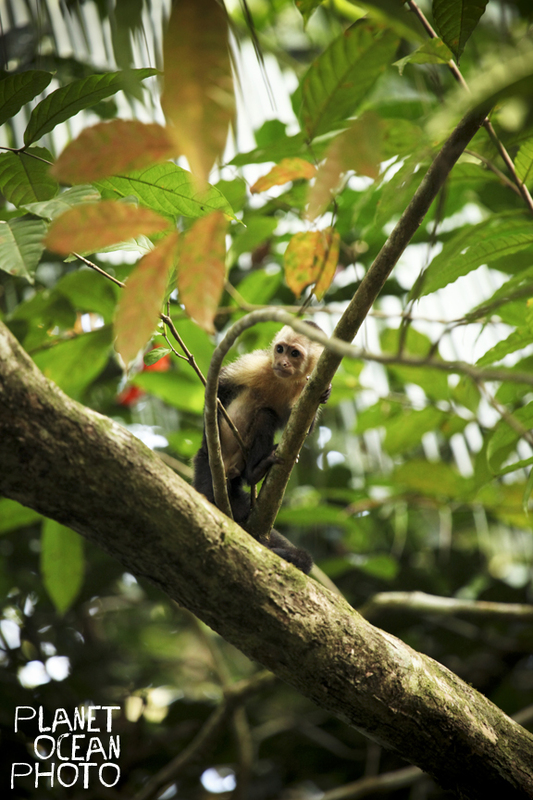 Maybe a pack of wild monkeys invaded the car, noticed Orlando’s calm fearless attitude, and welcomed him into their pack. Wherever he is, a lot of hanging around is going on. Monkeys! Glad you all are safe. Don’t forget to charge the spotlight. I know! Orlando is missing. So sad. I hope he is with more of his own kind instead of some crazy thief!